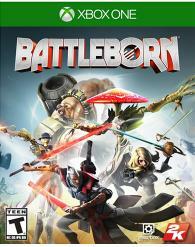 'Battleborn' is a hybrid FPS and MOBA from Gearbox, the makers of the Borderlands series. It is available now on Xbox One, PS4, and PC. The MOBA genre has done well for itself on PC but can be a tough sell to many players, as the games have deep, sometimes arcane rules and a constantly shifting meta. Several companies have tried to tap into the fascination with varying levels of success, but 'Battleborn' is the rare combo of first-person shooter and MOBA. In terms of marketing, I'd guess that the FPS aspect is the hook, but the MOBA elements are equally as crucial. The primary multiplayer gametype is Incursion. Two teams of five heroes square off on each end of the map, while NPC minions crawl down towards the opposing base. Mercs can be hired and turrets can be purchased to harass enemies. Each hero has three abilities, usually skillshots of some kind, with the third being an ultimate. Every hero has a role - some are tanks, some are healers, and so on, and they gain abilities with each level up. To win, a team needs to shut down the opposing core after whittling down their defenses. 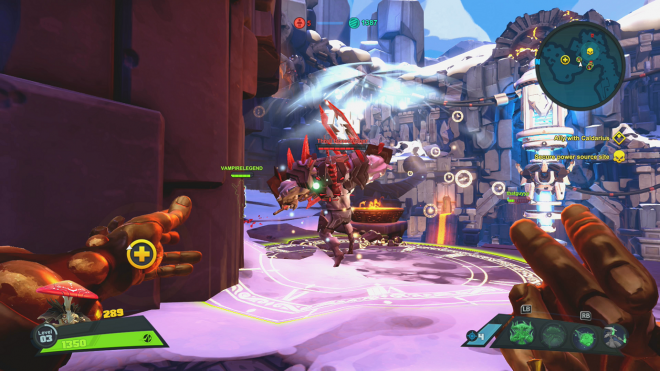 These are textbook MOBA rules, but in 'Battleborn' they have been paired with power-ups, wacky guns, and loud heroes for a more bombastic and glitzy experience, sometimes dumb but sometimes a real treat. The opening cinematic is typical Gearbox fare - very slick, with agreeable music and in this case, excellent anime-style animation to tell the story of the Battleborn. Afterwards there is the intro mission with Mellka, an easy-to-learn fighter with a machine pistol and debuffing claw lunge. Flush with excitement, I dove into the publicly matchmade story missions, and my expectations hit a wall of trope. All of the strategic balances that have been made to the characters in competitive mode are less useful in the story, where the AI is anemic and not all of the characters have a clear role. Wave clearers like Rath and Thorn are worth their weight in gold, but healers like the mushroom ninja Miko twiddle their thumbs a lot, throwing out knives for piddly damage while waiting with bated breath for their comrades to take damage just so they can be useful. Commonly used shooter formulae are on display here in full force, like the bullet sponge bosses that periodically throw up impenetrable shields at predictable intervals while adds flood the arena. These are preceded by long horde-style fights around a central macguffin to be protected, and quickly become stale. It has a serious case of trying to fit a MOBA peg into a campaign shooter hole, but at least most of the story content is mildly entertaining. It does try really hard to be funny, but often succeeds, especially with comical heroes like Montana and Orendi. The story itself is not badly written but also doesn’t make itself hard to ignore, even more so than Gearbox’s own 'Borderlands'. 'Battleborn' mixes the endless loot hauling of that game with some of the store system from 'League of Legends', represented by color-coded pickups that turn into equippable gear. It fits into the bulky and unwieldy Command leveling framework, where a mind-boggling array of challenges and unlockables accompany each character. It is a bit on the grindy side, but I have a feeling that many dedicated 'Battleborn' players won’t mind spending hours with a particular character in the hunt for traits and skins and whatnot. The competitive multiplayer is not perfect, but is a far sight better than the campaign and an admirable synthesis of two disparate genres. I gravitated there quickly after becoming bored with the campaign and enjoyed myself duking it out with many of the two dozen heroes. By and large they are fun to play, although everyone has their preferred playstyle. Snipers like Marquis who rely on quick skillshots are not as fun to me as a tank that initiates combat and uses map awareness to protect their friends, and thankfully there is something for everyone amidst 'Battleborn's respectable roster. The aforementioned Miko is invaluable during a Conquest match, especially when paired alongside a tough, large initiator like Montana who can hold his ground for a long time. This is where the obsessive strategy of the MOBA comes into play, and the group of friends that uses voice communication and a carefully selected team of heroes is going to have a clear advantage over five mute randoms. Matchmaking is decent at the time of this review, with most matches having an acceptable length and not ending in blowouts. 'Battleborn's visual style is a mix of comic books and anime. Characters are larger-than-life and highly stylized, with steampunk and fantasy affectations tossed in with the mostly cel-shaded sci-fi theme. Gearbox has made noticeable improvements to their tech, as surfaces and models look sharper and more realistic than in their previous work, even if lighting lags behind. The 30fps framerate is a bummer for a game where everything happens so fast, as even a slight slowdown could turn a hairy situation into a downright massacre. The voice cast is stellar, with lots of anime vets coming over from 'Dragon Ball Z', 'Ghost in the Shell', and the like. They bring humor to their characters, especially Ashley Burch, whose work as Orendi sounds awesomely similar to her Tiny Tina. The rest of 'Battleborn's audioscape has a high production value, something Gearbox has a knack for. 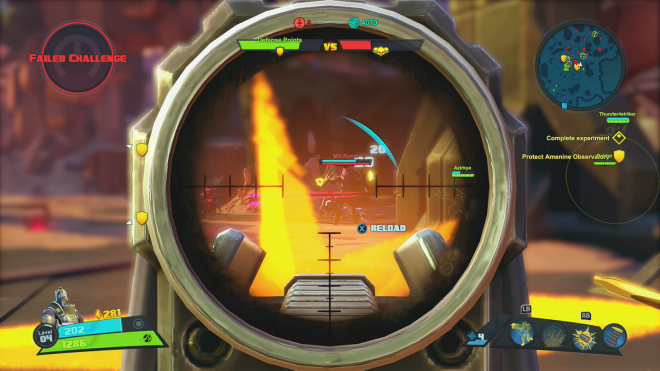 For all of its explosive fun, 'Battleborn's multiplayer is a bit on the thin side. 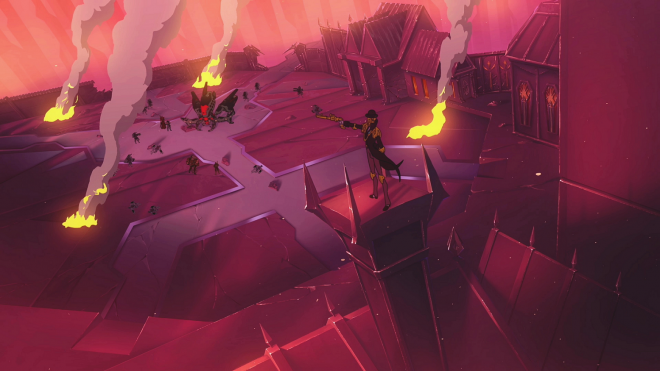 Maps are sparse and quickly repeated, the AI enemies never change, and there are few objectives to bring all ten of the heroes together at once for bloody fistfights. In addition to Incursions, Meltdown and Conquest join the list of gametypes. Meltdown is basically Incursion - minions are escorted to central furnaces where they die, and whoever burns off the most wins. Conquest, or multi king of the hill as it is known in other shooters, is more conventional but also where I found the best team fights. Whenever I found myself getting frustrated with Incursion’s methodical pace, I would hop into Conquest and just slay some nerds the old-fashioned way while trying to avoid being slain in return. On the surface 'Battleborn' is a lot like other competitive shooters we have seen in this generation: solid mechanics that provide a sweet honeymoon period, but are only held up by a stringy framework that brings down their replay value. I can see myself playing it a month from now, but six months, or a year? Anyone’s guess.